SELECT Alcohol Swabsticks are each saturated in 70% Isopropyl alcohol. 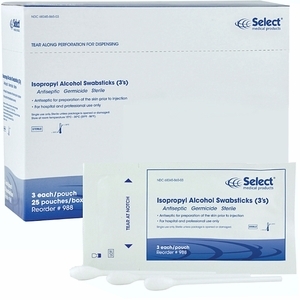 The alcohol prep swabs are a topical antiseptic and germicide ideal for preparing the skin prior to injections. Alcohol swab sticks help prevent the risk of skin infections. Box of 75 (25 packets of 3). Sterile. Item # 988.